Whether you're looking for a solution to messy salad dressing containers or inefficient liquor pourers, this 1 qt. pour bottle with green spout and cap will meet your needs! The white 1 qt. container is made of acrylonitrile styrene with straight walls that won't harbor bacteria, and a ridge that accepts the cap while not in use so it doesn't get lost. The neck gives your employees a secure grip as they pour drinks for customers and is detachable so it's easy to clean at the end of the night. The included green spout keeps bugs out and promotes fast, controlled pouring. When it's time to store product, simply remove the cap from the bottom of the container, screw it on in place of the detachable neck, and place it in the refrigerator! This 1-quart bottle is actually better than the more expensive version by Carlisle. I have 2 Carlisle bottles and 1 of these, this bottle is molded better, especially in the thread area. The colored spout also comes installed as opposed to Carlisle, where you have to struggle to insert it in. But my favorite feature of this bottles, is that it has the thread on the bottom, so you can screw the cap on, with Carlisle bottle there is no thread on the bottom. This bottle is an excellent value and I recommend it over the Carlisle bottle. Love, these pour bottles and their color coded bottoms help manage different juice and drinks, we use these green coded bottles for our Margarita mix. I mean what can I saw. This pour bottle is exactly as described. It’s easy to clean and very durable. I will definitely be buying more in the near future! Works perfect for adding flavored syrups to our hot chocolate. I love how the bottom comes off and it disconnects in the middle because it makes it easy to clean. The 1 Qt. Pour Bottle with Green Spout and Cap is great for color coding. It is well made, durable and easy to clean. It is great for storing homemade sauces and dressings. The spout and cap fits and seals well. Does your bar or restaurant use color coding to increase efficiency and decrease customer wait time. If so, these green pour bottles are an excellent choice. These bottles feature a break resistant design. All the components are removable which make them very easy to clean. I love this style of bottle. I've purchased 5 or 6 in different colors to use for my snow cone syrups. It is less messy than trying to pour from the large gallon jugs. I also have a wet bar in my home & a portable bar near my pool that I use these & not worry about having glass at poolside where accidents can easily happen. Throw them in the cooler & they are leak proof. Really well made and efficient product. 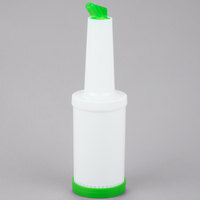 This bottle with green spout and cap is used to pour and dispense product and then simply put the cap on and store it. Great pour bottle with color cap, we ordered multiple bottles with different color for visual sign to distinguished different ingredients. It made it easier to mix drinks. Purchased 3 of these over a year ago. They are used and cleaned constantly during the day and are just now starting to show wear and tear. Priced right and completely functional. I'm sure it's great for all types of things like melted butter, dressings, oils, and sauces but I use it primarily for water only. I keep it at the flat top and use it along with a basting lid to melt cheese on burgers, steam a few vegetables, etc. Serves my purposes. Bought this to store my homemade chai. It's a very pretty green, sturdy, and didn't leak when I shook it. The neck is textured for easy gripping, even wet-handed. Only time will tell if the tea stains it. Two things: I had ONE HELLUVA time getting the pour spout into the neck. That pour spout is about 1/2" too tall to fit on the top shelf of a home refrigerator. great container to put juices in, or use in the kitchen for a variety of things. The price is good and the color makes it easy to distinguish from others! LOVE these bottles! The different colors make it very easy to identify the different mixes contained in them. Some containers only have a colored bottom which if you're a bartender, you know does not help at all. Tip is colored which makes all the difference in the world! Great container to store liquid in to pour out. Even has a cap to keep stuff in if you not using the pour. Great to keep clean and dishwasher safe, with a bonus of keeping things color coordinated. These pours are just like the more expensive brand name ones but at a fraction of the cost. Overall great product, will definitely continue to purchase these!!! I love these juice pourers. I use them for keeping mixers fresh in the refrigerator. I use them at home for alcohol which comes in bottles that don't fit well in the refrigerator. These bottles are a life saver when we are very busy since we can make the particular mix or drink and have the pour bottles labels, so it makes service much faster. Perfect bottle to put juice in. Very handy and the liquid doesn't come out. They also have all the colors of the top pourer which is really cool to match with the different liquids. These work great for all of your juices and mixes. The different colors are great to distinguish which container has what. The cap, which is the bottom of the bottle in the picture, is great for storing mixers that will last overnight. Easy to screw on the top and cap and comfortable to grab quick when mixing in a hurry. This didn't work for my particular uses (I was thinking of trying it to pour funnel cake batter) but I'm not throwing it away. It's very easy to fill, although the bend at the top makes it a bit challenging to wash thick liquids out of it. These pour bottles make storage and usage of juices and other mixers a snap. The convenient pour spout helps regulate the flow of mixer, and the handy color-coded cap (which stores on the bottom when not in use) makes saving and refrigerating the contents easy. These are so easy to refil and we put lables on ours so we didnt have to mess with buying the small packets of condiments. The look great easy to clean and easy to store! So glad i found these!! Just what the doctor ordered for dispensing toppings onto the deserts we sell. With the store and pour design it is easy to refill the bottles. I purchased different colors to use for salad dressing. We color code our dressings and mark them to find them easily. The tip on the cap is a little small for thicker dressings so we just remove them for easier pouring. They also stack well in fridge. This bottle is priced to sell. Not to mention it is color coded so you can know what you put in each color. I use these at home and in my business. We use one of these for the mixing of one of our salad dressings. It has been a excellent product that cleans up very nicely and more importantly very easily. Worked great for about 4 months, then the top came apart at the strips that grip the bottom when tightening. But, price is good enough to just replace them. Use these for a thousand things in a busy restaurant kitchen, including maple syrup pourers, sauce and dressing pourers, etc. Super great price and very sturdy. good for sauces or nuts, we use these , for salads we put raison or cranbery , as topping for salads it is also good for croutons. The safest and fastest way to pour dressings. I use these for guest and they love them. The material keeps the dressings at temperature so they last a lot longer. Great store n pour bottles. Excellent for any bar! Works wonders to quickly dispense a multitude of drinks and juices. Color coding allows for quick identification of drinks!!! Your Store N Pour containers are absolutely what I was looking for. They're sturdy and I love that I will be able to color code my juices and mixers. These Store N Pour containers are absolutely awesome. They're much more reasonably priced than a lot of brands, and you can color code the bottom for faster identification of your juices.